VMware announced in this KB article 19 discontrollers initially listed on the VSAN compatibility list have been removed from this list. This makes the controllers unsupported for usage in VSAN configurations. 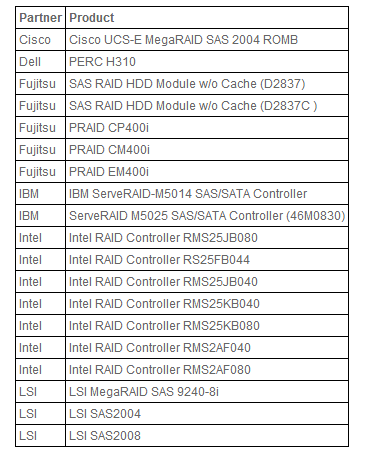 As part of VMware’s ongoing testing and certification efforts on Virtual SAN compatible hardware, VMware has decided to remove these controllers from the Virtual SAN compatibility list. While fully functional, these controllers offer too low IO throughput to sustain the performance requirements of most VMware environments. Because of the low queue depth offered by these controllers, even a moderate IO rate could result in IO operations timing out, especially during disk rebuild operations. In this event, the controller may be unable to cope with both a rebuild activity and running Virtual Machine IO causing elongated rebuild time and slow application responsiveness. To avoid issues, such as the one described above, VMware is removing these controllers from the Hardware Compatibility List. One of the controlers removed is the Dell PERC H310. Likely one of the reasons this controller has been deleted is a serious issue described at Reddit.com. A VSAN user experienced basically a meltdown of its virtual infrastructure when a VSAN node failed and after a while a rebuild started. This caused so many IO the PERC H310 could not handle and all VMs came to a standstill.